If you are searching for a Minecraft game which your hands must move quickly, Whack A Craft should be in your list. In Whack a Craft, players will click tiles to tear them into pieces. 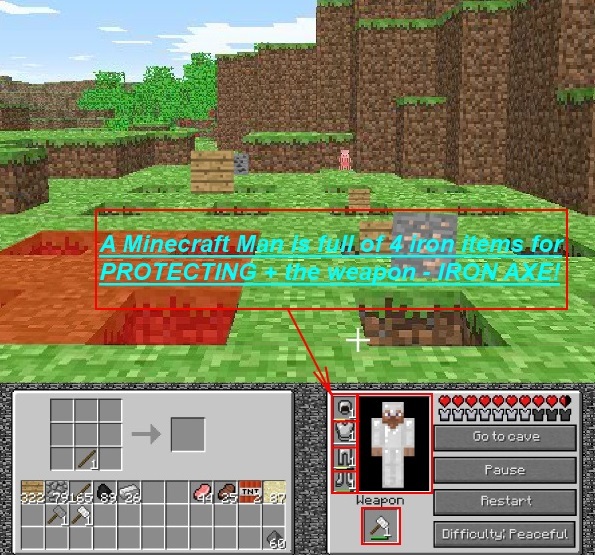 Pieces of different materials will be used to craft objects such as a weapon and armor. Players must be fully equipped before facing numerous waves of enemies. At the beginning of Whack a Craft, players can choose a suitable level of difficulty such as Peaceful, Easy, Normal, Hard, or Extremely Hard. During the process of collecting enough materials to craft things, creepers are awful since each time they shake their body, they take your lives away immediately. Pressing PROTIP at the end of the screen will guide you which materials can craft a certain item. Furthermore, it reveals some useful tips to save players’ lives and play Whack a Craft easier. For instance, when creepers pop up, they will be got rid of if players click on them quickly. Whack a Craft is looking for quick players who can defeat all evil creepers. Play Whack a Craft and share what you think about the game! + Shooting and crafting are done with the mouse. + PROTIP seems to be the most informative source providing recipes and tips.